How many times have you seen a blog post or book chapter begin with a quote from a subject matter expert? It’s called content curation. Increase publishing velocity and volume. How about that? I re-used something I said that was published previously—another form of content curation. Given all the benefits of content curation, it’s good to know there a variety of ways to do it. Therein lies the not-so-good news: A ton of content curation is a complete bore. It’s used bubble gum. It’s the result of a blog owner or social media contributor playing the “Get Out of Create New Content Free” card. I’ll concede the “you should read this” update has its times and place. A tweet is a good example. Said tweeter (presumably) read said content creator’s creation and deemed it share-worthy. Said tweeter could editorialize for a word or two by adding something like “Great post,” but there’s no real value-add. Nor is there any harm done. That’s bull. In my opinion, content curation has to include creating new content, or it’s noise. Your curated content is only interesting if it has a point of view—your point of view. What Kind of Curator Do You Want to Be? The key to content curation is context. Giving it context makes it new and potentially interesting. It makes me give a hoot. It gives curation—and the curator—a reason for being. No one’s stopping you from being the lazy kind of curator who continually repeats the refrain, “Look what I found.” In fact, oodles of companies have created “collect and curate” tools that encourage this uninspired publishing tactic. I’d like to be the guy that urges you to reject the approach and curate with that special something only you have: your voice. This is my favorite technique of the bunch. As I’ve done already in this article, you simply include quotes that add perspective to your story. The most popular way to curate content is to share something you like (or don’t) via social media. Want to increase the mileage of your social share? Check out Start A Fire, a service that adds a badge with your content recommendations within any link. Start A Fire helps drive traffic to your content by showing readers who click on your links your content recommendations. 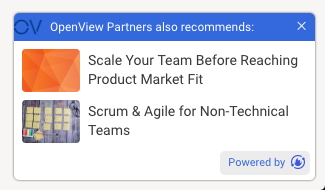 It’s easy to tune out email newsletters when the sender relentlessly promotes their own company, or even their content. A more interesting approach is to curate “best of” content focused on a niche. 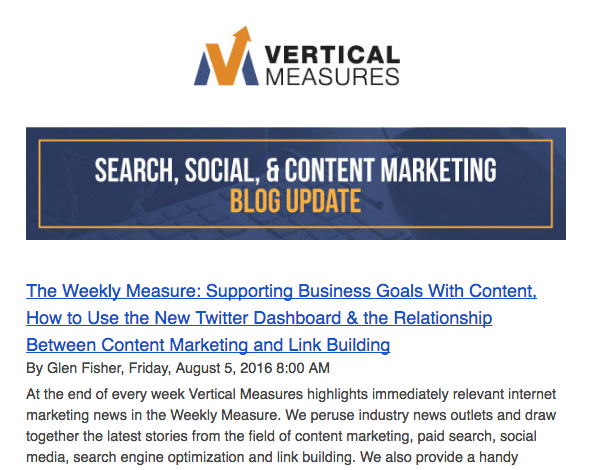 I actually look forward to getting this digest style newsletter each Friday from Vertical Measures. The editor of the email clearly digs to uncover valuable digital marketing content. If curating content is about delivering valuable reference material, lists may be the pinnacle. Lists might be about books, podcasts, blogs, tools, apps, or anything thematically related. You can create lists in a variety of forms such as a blog post, web page, ebook, infographic, or email. Check out List.ly, a magical list-building tool. You might consider collections to be lists, but they can take many forms and become very engaging when they feature visuals. Think recipes, photos, quotes, or website designs. A roundup is a piece of content made up of responses from a number of industry experts. You might get the content you need by sending emails, making calls, or simply finding what you need in blogs and on social media. Roundups can take a lot of effort, but deliver huge rewards. It can be very simple to curate research, and your audience is likely to love it. 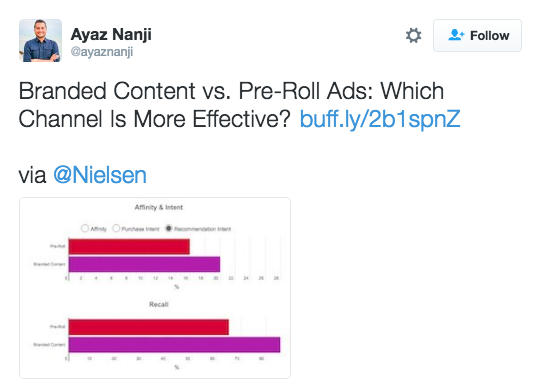 Ayaz Nanji, a blogger at MarketingProfs, has a dedicated beat: he curates relevant marketing research. A tasty and fun approach to curation is to ask your audience a question or series of questions and publish the results. You can apply this strategy to create roundups, lists, collections, research findings and more. Does your company publish case studies or customer success stories? Why not repurpose some by abbreviating them and curating the content? An easy and valuable way to curate content from experts is to gather ideas from events. One simple strategy is to present highlights from a conference. Another is to create content based on a webinar or seminar. Presenting a post you like on your blog can be the most—or least—interesting approach to content curation. Though I’m ever-so-slightly flattered when a publisher finds my articles tasty enough to republish, I’m unimpressed if that’s all they do; they copy and paste my work into their website. Create a new and interesting headline. Write a thoughtful introduction to present your perspective. Interview the original author and add quotes. Bounce back-and-forth in your post between a previously published post and your commentary. Use your imagination. Put your fingerprints on the post. Never steal content. Always cite the original author and source. And, if you’re republishing without adding a thing, use a canonical link so as to not steal someone else’s SEO thunder. Your audience may love your taste in online videos, SlideShares, infographics, data visualizations, quizzes, podcasts—any digital media. Try your hand in creating content based on a cool chunk of media you’ve discovered. Newsjacking, a term coined by David Meerman Scott, is simply capitalizing on a popular news story by featuring it. Storify is a great service you can use to create stories or timelines using social media such as Twitter, Facebook, and Instagram. Creating microsites or content hubs focused on specific topic requires some extra effort but can be an amazingly magnetic curation tactic. It can be done with other publisher’s content, your own content, or a combination. I’ve used the microsite strategy to create the Content Marketing Roadmap, a page on my site that curates many of my best posts, infographics, webinars, and tools on the topic of content marketing strategy. Curated content need not be dull, but it often is when marketers desperate for content mindlessly republish the works of others. You can do better. Bring your perspective to the content you curate. Mix up your tactics. 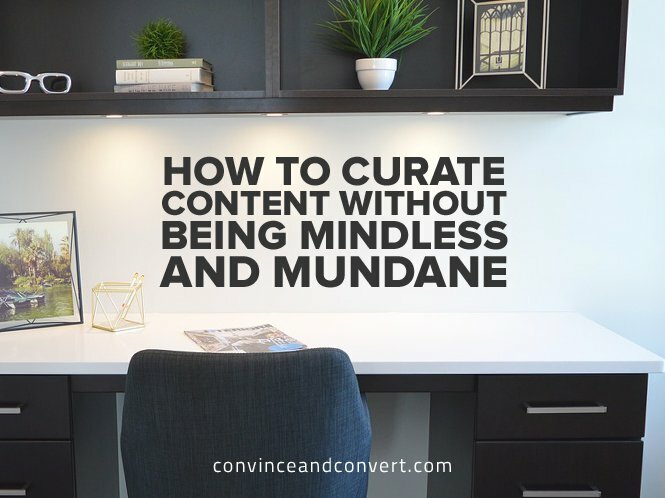 There’s no shame in curating content to save time, but to do it meaningfully does indeed take time and effort. Align your content curation strategy with your content marketing strategy at large, and create something original.